communication in the context of the indieweb refers to using your personal website as a starting point and potentially way for people to contact you. 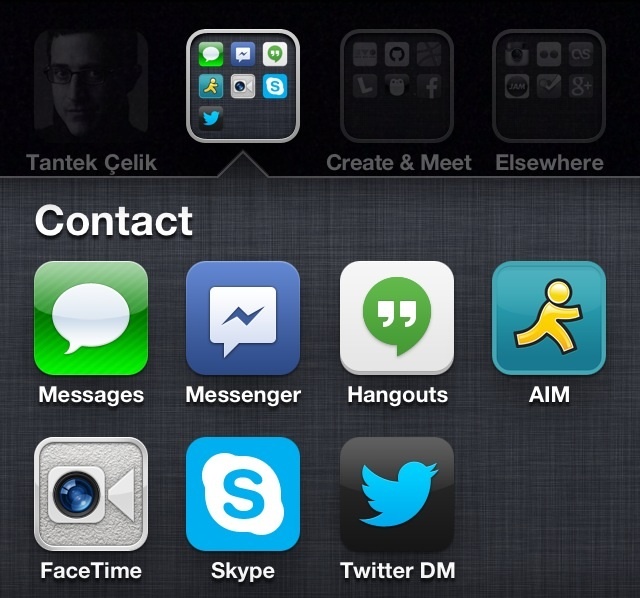 Add an icon to your personal site so that others can add your site to their home screens on their devices. Put an h-card on your home page with links to ways you want to be contacted, in your preference order. Easily recognizable / clickable icons for each link to a way to contact you. IndieWeb community members doing this. Where he has a similar mockup of an mobile phone home screen / app buttons UI with clickable links (with various URL schemes) for various contact methods, as well as links to his profiles on various silos and communities. shows an animated "Add to Homescreen" instruction drop-down on first load. See also: FreeMyOAuth for additional common silo button images. Let's Talk is a userscript that renders h-cards in a standard format. When you go to someone’s web site, Let’s Talk shows you at a glance how to contact them and which methods they prefer. See https://snarfed.org/2014-03-10_lets-talk-userscript for more details. Perhaps enabled/disabled based on sign-in, time of day, sleep status etc. 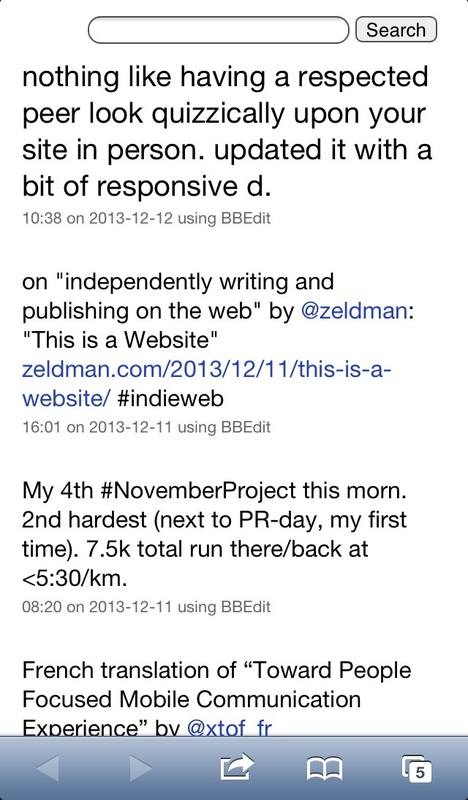 the recipient's IndieWeb server would send a push notification to the recipient's currently active client devices (e.g. mobile, laptop). the recipient's IndieWeb server sends a push notification to the recipient's currently active client devices (e.g. mobile, laptop). So people can txt you without ever leaving the web, or depending on a 3rd party site/intermediary/service/addressing system. Ideally the mechanism for an audio call, while in-progress, could allow the caller and/or callee to opt-in to allowing for video, and if both did so, the audio call would be upgraded to audio+video. /call - redirects to a FaceTime (audio) URL, or tel: URL, or provides a WebRTC start call UI. 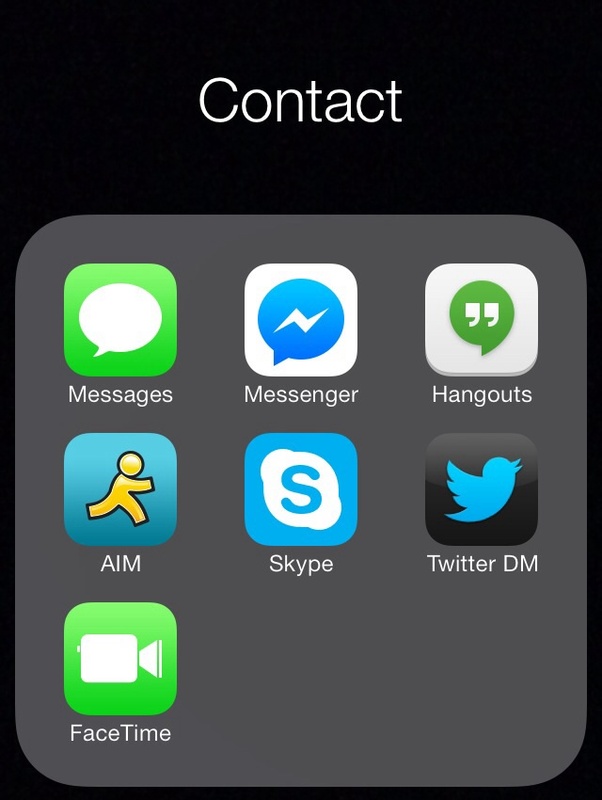 When a viewer taps the Contact icon folder it expands as follows, and then the viewer can tap the mode of messaging/communicating they want to use to contact me which immediately opens a new message (txt, FB Messenger, G+ Hangouts, AIM IM), or starts a new call (FaceTime, Skype), or Twitter new direct message window. Directly to communicating - bypassing all comm app home page / activity distractors. The one change I'd make from these mockups are some of the labels. All of the labels should be verbs, not nouns, indicating the action the user wants to take and thus reinforcing their intention. E.g. "Messages" should be "txt message", "Messenger" should be "FB message", "Hangouts" should be "GTalk", and the rest seem to read fine as verbs. Currently sites have to use a convoluted script to attempt to prompt the user to add their comms page to the home screen AKA install it. The user must visit your site "twice over two separate days during the course of two weeks." When communicating from one indieweb user to another, how do you authenticate that the person you are communicating with is actually the person you think it is? This applies to messaging in general. This page was last edited on 15 March 2019, at 18:16.